This is an excerpt from the original broadcast on Asahi Television Japan – showing the controversial cellular telephone experiment, code-named ‘Project Achilles’ by Dr. A.K.Dewdney – and one of the primary motivators for much further research on the topic including the formation of this very site. 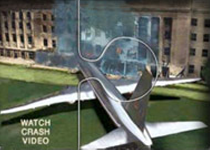 The experiment has also even motivated Pentagon sources to have the official story of the events of 9/11 modified. The experiment makes clear the impossibility of being able to maintain or even establish air-to-ground cellular communications – which the entire ‘story’ of the day of 9/11 depends on in a fundamental way. Unless the passengers of any of the flights were able to make a clandestine phone call on their personal cellular phone – there would be no way to establish the existence of ‘arab terrorists’ on the plane. Try it for yourself as a thought experiment – everything hinges on the impossible!